Cardi B wants fans to respect her boundaries. Cardi B is used to winning but she seems to be having a pretty tough week. After beefing with Azealia Banks and catching major heat for her verse on Rita Ora‘s track, “Girls,” the rapper has more drama to deal with. This week, video surfaced showing a very pregnant Cardi B in an altercation with a fan at a shopping mall in Las Vegas last month and now she’s setting the record straight on what really went down. Uh oh! 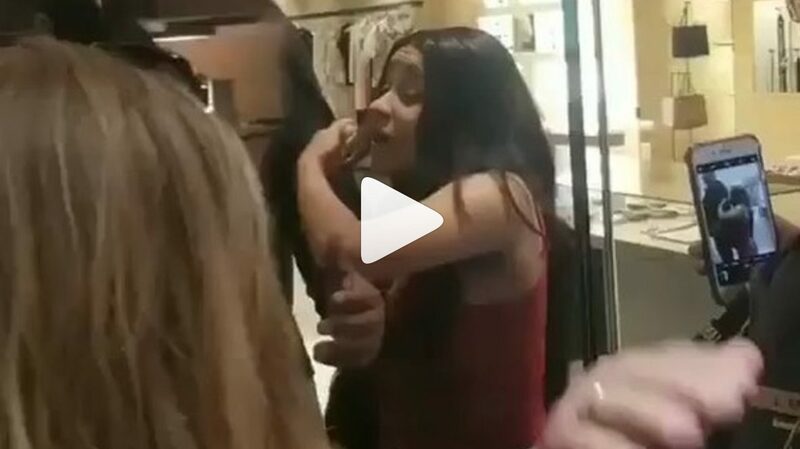 A video has surfaced showing a pregnant #CardiB getting into an altercation with customers inside/outside a store recently. Word has it the customers were asked to leave or not let inside the store so Cardi could shop without being disturbed. Things went left. The clip shows Cardi B yelling at a woman through a store’s glass window with security standing between her and a couple of fans screaming obscenities at the star. The “Bodak yellow” rapper tweeted, then deleted her explanation about the fight that she says was kicked off by an autograph-seeking fan who got angry when she refused to sign her name. She insists he and his friends followed her to the store to harass her for refusing their humble request. When a follower responded to her now-deleted posts and said she never stops to sign autographs for fans, Cardi B reiterated her point of view. “I always take pictures with fans. If I don’t have no makeup, in a rush, not in the mood, I’m not obligated and not everybody is YOUR FAN. Clearly,” she replied. It looks like the expectant mom is tired of the constant Invasion Of Privacy from her fans. With her first baby in her growing belly, can we really blame her?